Room 104 (as I believe all the rooms are) is a one bedroom apartment not a studio so it was nice to spread out. Everything was very clean an$ the safe box in the room was the largest we ever saw. 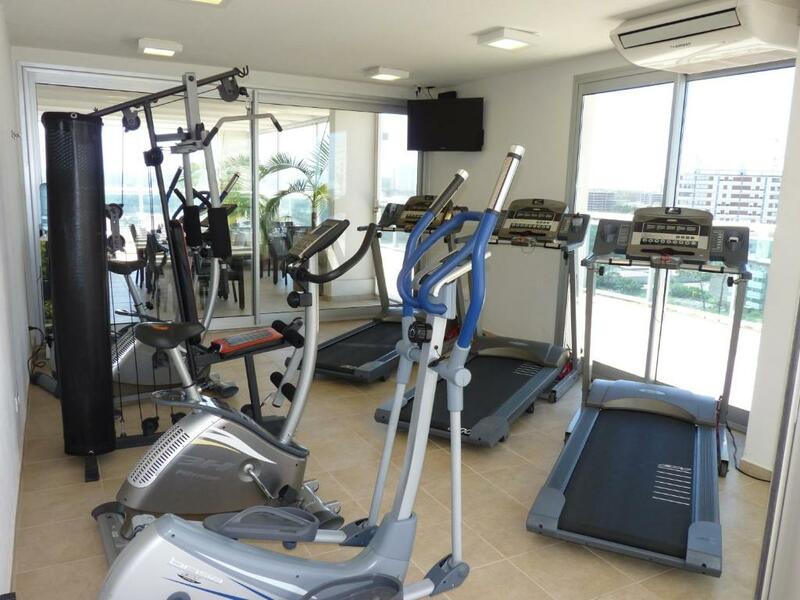 The breakfast was not bad and I did use the small fitness center and it was adequate. It was nice having an assigned parking spot in the garage. WiFi was very good. The use of space was fantastic, making for a great stay! Location was great. The property was very expensive but the location and amenities were great. Wished they had a better breakfast for those prices. 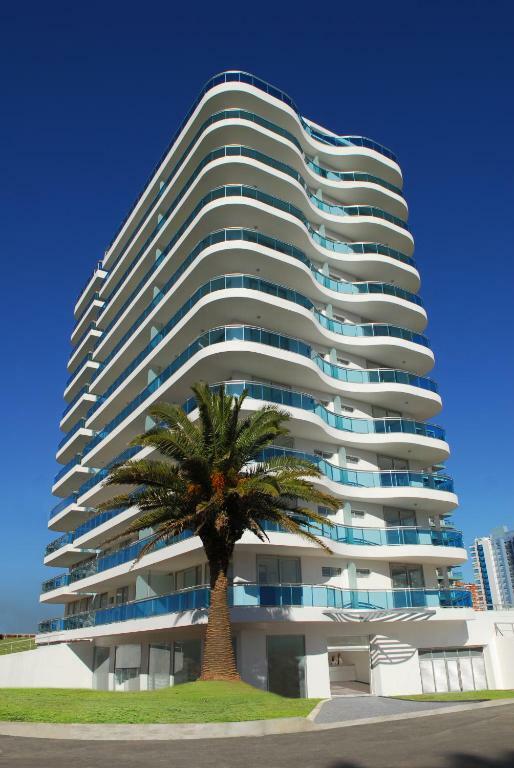 Otherwise, nice beach access and good onsite amenities. Excelente atención de todo el personal. Lugares de parking muy cómodos. El desayuno estuvo perfecto. Piscina y sauna’s excelentes. 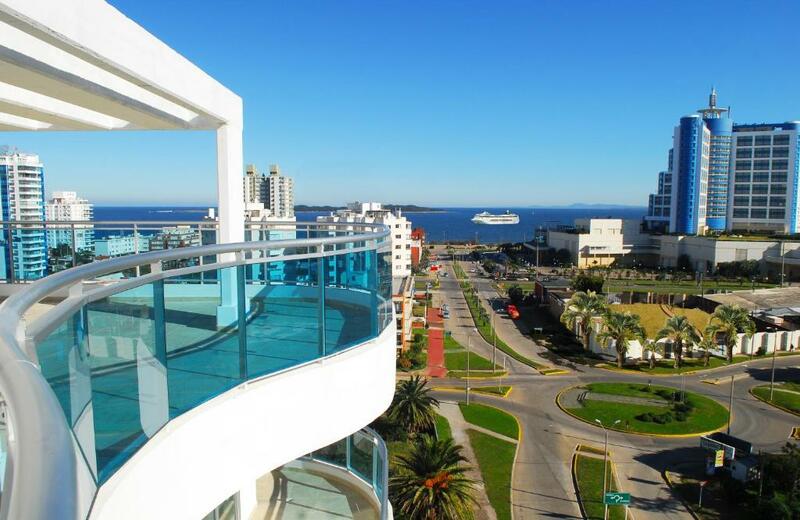 El lugar está muy cerca del centro de Punta del Este y a metros de Enjoy Conrad, y muy cerca de playas, lo que hace que sea ideal para no tener que utilizar el automóvil y disfrutar de buenas caminatas. El check-in y check-out fue muy rápido. La habitación, la vista y el trato del personal fue espectacular. Buen desayuno incluido con vista a la ciudad y con un horario amplio. Muy bien ubicado el edificio, cerca de todo. Sin dudas es un lugar al que me gustaría volver. Lock in a great price for Sol y Luna Home & Spa – rated 8.7 by recent guests! Sol y Luna Home & Spa This rating is a reflection of how the property compares to the industry standard when it comes to price, facilities and services available. It's based on a self-evaluation by the property. Use this rating to help choose your stay! 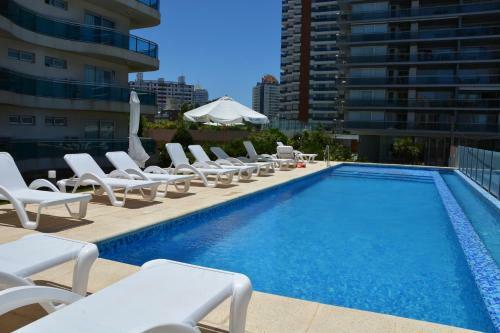 One of our top picks in Punta del Este.Located 1,000 feet from the Brava and Mansa beaches, Sol y Luna Home & Spa offers self-catering accommodations with free Wi-Fi and continental breakfast in Punta del Este. Punta Shopping commercial center is a 10-minute walk away. 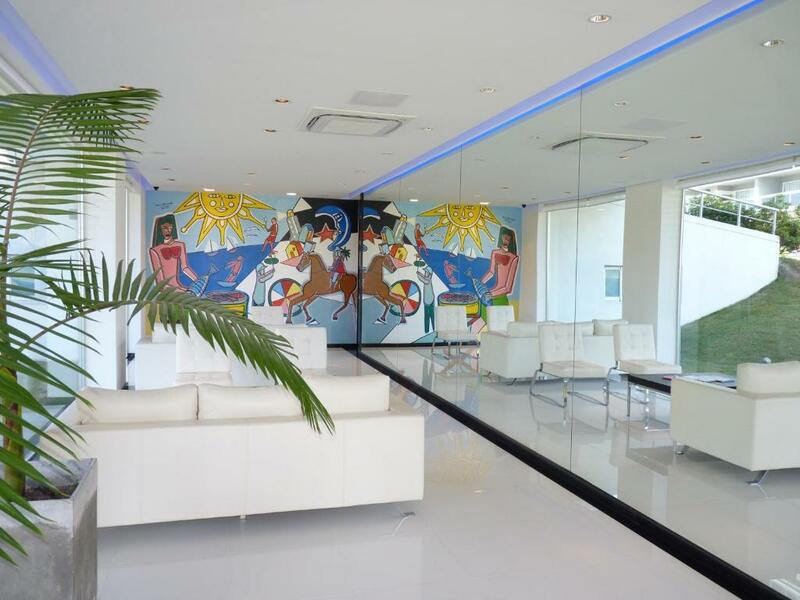 The apartments in Sol y Luna Home & Spa feature 2 LCD TVs, DVD player and air conditioning. A maid service is provided. Sol y Luna Home & Spa features a heated outdoor pool, a fitness center, BBQ facilities and panoramic views. Beach service and sun chairs are provided. Coffee and snacks can be ordered on the terrace. The hotel offers a discount card to be used on site, for discounts in the spa and on food and drinks. Sol y Luna’s spa service includes hydrotherapy, sauna, Turkish bath, Scottish shower, hydromassage tubs and massage sessions. 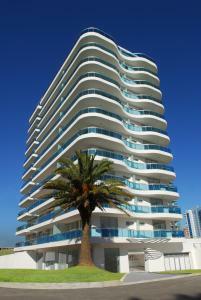 Guests can request laundry services and free private parking is possible on site. Sol y Luna Home & Spa is 250 feet from Francia commercial avenue and a 10-minute walk from the city’s financial center. The artisan fair is 0.9 mi away and Capitán de Corbeta Carlos A. Curbelo International Airport is 9.3 mi away. Aidy Grill is a great choice for travelers interested in beaches, ambiance and beach walks. 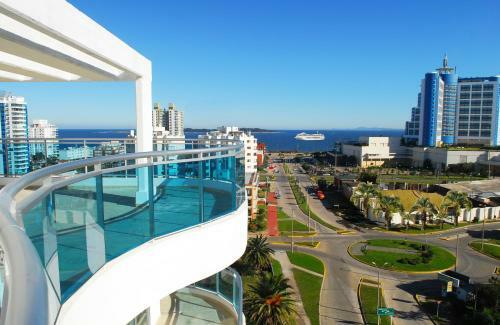 This is our guests' favorite part of Punta del Este, according to independent reviews. 뀐 Located in the top-rated area in Punta del Este, this property has an excellent location score of 9.1! 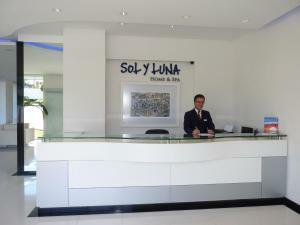 When would you like to stay at Sol y Luna Home & Spa? Self-catering apartment featuring LCD TV in the living room and LCD TV in the bedroom, DVD player and air conditioning. Units are located between the first and fourth floor. Self-catering apartment featuring 2 bedrooms, a furnished terrace, LCD TV in the living room and LCD TV in the bedroom. It is equipped with 2 bathrooms. This apartment has a sea view, kitchenette and dining area. Units are located between the fifth and tenth floor. This apartment features a oven, kitchenware and tile/marble floor. This apartment has a tile/marble floor, seating area and balcony. Atención personalizada en donde se destaca sus RRHH que han sido especialmente capacitados . Por otra parte, por su localización ubicada entre playas Brava y Mansa. A sí mismo, por las características de sus apartamentos. Nuestro compromiso es la mejora continua. A pocos metros del mar con serenidad y seguridad. Area Info – This neighborhood is a great choice for travelers interested in beaches, ambiance and beach walks – Check location Excellent location – show map Guests loved walking around the neighborhood! House Rules Sol y Luna Home & Spa takes special requests – add in the next step! A USD200 damage deposit is required on arrival. This deposit will be fully refunded at check-out, as long as there isn't any damage to the property. Sol y Luna Home &amp; Spa accepts these cards and reserves the right to temporarily hold an amount prior to arrival. Sol y Luna Home & Spa accepts these cards and reserves the right to temporarily hold an amount prior to arrival. Please note, beach services are provided from December 1 to February 28, Carnival and Easter weekend. The outdoor pool is heated and available from December to March. The hydro-massage's availability will depend on climate. Full payment will be requested upon check-in. Please inform Sol y Luna Home & Spa of your expected arrival time in advance. You can use the Special Requests box when booking, or contact the property directly using the contact details in your confirmation. A damage deposit of USD 200 is required on arrival. This will be collected by credit card. You should be reimbursed on check-out. Your deposit will be refunded in full by credit card, subject to an inspection of the property. Fitness center is too small. Perfect location. Comfortable and spacious rooms. Extremely small bathroom and noisy. Room was cold even with the heater on - ended up with a cold which had ruined the following 5 days of holiday. Breakfast was poor for such a high end property.